“The Cure for Summer-Time Blues”. What are you going to do next year when the UK Rivers show their bones and the reservoirs turn into Turkish baths? I’ll tell you what you’re going to do, you’re going to treat the wife and kids (wait for it) to a fantastic holiday in Canada. You are selflessly going to give them hours of fun canoeing, kayaking, camping and swimming. And while you’re at it, toss in a travel rod just in case the odd moment crops up where you can wet a line. If you want a water-activity based holiday in the Sun, this is the ultimate family destination that has it all. If you can picture a completely unspoilt lake district with affordable accommodation, thousands of lakes in every direction and as remote or busy as you chose, you would be in Ontario, Canada. From the UK it takes about 7 hours directly to Toronto. Well, if you do have the kids in tow, I guess you’re going to make plans for the school holidays and you’ll want to make it a 2 or 3 week trip late in July or any time in August. If you are more flexible, why not try September when the flights are cheaper. The Climate is a warm 25-30 degrees in August, though the odd thunder storm can happen so be ready for it. You are aiming for Toronto Airport and then making it up as you go along. As one aging rocker said “No Jacket Required”. If this country were any more laid back it would fall over. Depending on your sense of adventure and budget you can basically fly without baggage and do it all when you land, everything is so cheap at Wal-Mart and Canadian Tyre supermarkets that you can take cash and credit cards and just have a blast. Otherwise pack at least these items; Shorts, T-shirts, Water-Shoes, Bug-Spray, Sun-Cream, Drivers Licence, Sun Glasses, Light weight water-proof Jacket, maybe a fleece/tracksuit for the evenings around the fire pits. Oh yes, before I forget, Fishing stuff. Canadian Affair/Air Canada are two airlines we have used, see what deals you can get, we have found Charter flights from approx 100 quid each way per person to 400 quid per person round trip in high season with the scheduled flights. YOU WILL NEED A RENTAL CAR which depending on category can be had for about 100-150 quid a week pick up and drop off at Toronto. This is the easy part. Decide on how much “solitude” you need, how far down the “Ray Mears Survival Experience” the wife can go before cracking, and how much dough you want to spend. Starting at the “full-nutter” level, I would have to recommend the Algonquin National Park less than 4 hours drive north of Toronto. It will need some forward planning and you will have to rent Canoes directly at the entrance to the park where you can Park and leave the car. “Portage” is the way to go, with pre-reserved camping spots at the edge of the lakes which are very private and have a fire pit and a wooden hut loo in most cases. You will need to buy or rent camping equipment. If you are comfortable with things that WILL go bump in the night, such as Moose/Deer/Racoons/Foxes and the remote chance of a bear, the Algonquin is the place to be. Hundreds of Miles of pristine Lakes, (some link together, some need you to carry the Canoe a few hundred yards) await you and they all have great fishing. Don’t worry too much about the “Bears”, the Canadians take them with a pinch of salt, and as long as you don’t leave a ton of smelly food in your tent, you will not be having a Yogi in your sleeping bag. If it makes you feel better, take a can of Pepper Spray, a loud whistle or an Air Horn with you, in the unlikely event that your picnic-basket becomes too tempting, make as much noise as possible, NEVER RUN, and make sure you back away upwind slowly (leaving the food behind of course) so that if you need to use the spray it doesn’t blow in your face. When I questioned my P*ss-Taking Brother in Law (P.T.BIL) about Bears, he explained that Ontario has mostly Black Bears, not Grizzly Bears. With Black Bears (they can look Brown) you need to wave Branches, Scream/Yell etc to scare them off. With Grizzly Bears, try Pepper Spray and Blowing a whistle or “Playing Dead” as a last-resort. “Great” says I, how do I know if it’s a Grizzly or a Black Bear?. P.T.BIL advised me to look around the area for Bear Crap to familiarise myself with the species, apparently Black-Bear Crap is full of nuts and berries, and grizzly poo smells of pepper and has the odd whistle in it…. In reality, there are very few Bear Attacks and there are lots of ways to avoid seeing them. The Parks all have lists of do’s and don’ts to help you. The “Slightly” Adventurous among you may prefer a cross between a Tent and a Hut, called “Yurts”, these are in more populated areas of the Algonquin and are already set up so no tent stuff is needed. If the thought of all that wild-life puts you off, and like me you end up having to get up 5 times in the night to “check the kids” or “hold the torch while I go for a pit-stop”, it’s probably worth going B&B or renting a “Cottage” if you have a group of you to split the cost. Huntsville is the Main town in the North of Muskoka, and provides the most “civilisation” in the Muskoka’s, there are lots of place to eat, nice “touristy” shops and supermarkets. Many Lakes are all around Huntsville and the Algonquin Park is 45 minutes away if you do want to go into the wilderness for a few days. At the expense of being quoted around the Forums and Fishing world, “Canadians Love to Cottage at the week-ends!” There it’s out, said and in the open. As a Caravan is to a Dutchman, the weekend Cottage in Muskoka is the Eastern Canadian dream. In fact, you can buy a T-Shirts that say “Welcome to Cottage Country!” or “Week-End Cottager”. We have one, I admit it. It’s not really a “Cottage” but it’s a house on a Lake and in “Cottage Country”, so all efforts to rename it “The Lake House” have thus far failed. My P.T.BIL on our first meeting decided I looked like a Cross between Elmer Fudd and Kevin-The-Gerbil, so as soon as the “Cottage” was purchased he had the kids make a sign and name the place “Squirrel Cheeks Cove”, our neighbours still think this has to do with nut-eating-vermin, sigh. If you really don’t want to have the wilderness and the Family would prefer to HQ at a “seaside” resort, there are a couple of places within a couple of hours driving distance from Toronto which have loads of attractions for the family, Wasaga Beach on Georgian Bay, or Sauble Beach on Lake Huron. The Sauble Falls Park/Camping ground is fantastic, the river which runs from the Camp to the Lake has a good amount of Small Mouth Bass and in the Spring and Fall has a huge run of Steelhead (Last Sat in April is Open Season) I watched them last year and saw fish up to 15lbs being caught on roe bags trotted down the river. The Great Lakes are HUGE, you would not know they are Lakes; the Waves can be crashing in to the Beach and great fun for everyone, added bonus NO SALT water. The “seaside” resorts have water parks and theme parks, hot dogs, ice-cream and lots more people than Muskoka Lakes. You could do a Week of each and make the best of both worlds. Number one on the list has to be a Float Tube and Fins/Flippers, there are thousands of lakes you can’t drive for half an hour without passing a sign for “Insert animal-or-fish-name Lake” If the Wife and Kids want to go out exploring, throw the tube in the boot. The Kids can play on it and you get to fish in peace later on. I would recommend stopping at the Toronto “BASS PRO” shop in Vaughan, 30 mins north of the Airport on the side of the Motorway. Buy all your camping/fishing/tube/snorkel/mask/fins/toys/bulky stuff at very low prices to save the packing at home and to make the most of your trip. Chuck the lot in the car and buy a cheap suitcase at “Wal-Mart” to haul it home later. Another good source of Camping Stuff can be Second-Hand charity shops; we have bought great stuff for next to nothing for camping trips. If you do wish to drive around with a Canoe/Kayak on board, make sure your rental car is suitable for putting stuff on the roof and strapping down with ties, one car we rented had a full plastic front cover/bumpers with no suitable tow point or Chassis access to hook the straps on to secure the Canoe. Petrol is half the price of the UK, so you don’t need to scrimp on a group “A” match-box car (I’m showing my age again). OK, you’ve cracked it, you’re here, you’ve got a yearly non-resident fishing licence for 20 quid from the local fishing tackle shop/Wal-Mart or Canadian Tyre, float tube, a 7/8 weight tip action rod, one floating and one intermediate or sink-tip line and lots of flies (see Flies), the misses and the kids are still asleep. DO NOT MISS THE EARLY HOURS. From 6.am to 8.00am on a warm summer dawn with hardly a ripple on the water, it’s time to use the “Poppers”. The water will be warm, so forget the Waders, the added bonus of not having to leave the water for a pit-stop is soon evident when the water hits the “OH”- zone. When fishing “Poppers”, cut off “too much” tail or “too long” rubber legs, it slows down the casting, opens the loops and makes the leader twist. Slowly and quietly paddle round the margins, weed beds, docks, sunken trees and rocks, then cast, POP and STOP. You POP to get their attention and you STOP to trigger the Strike. Land it within a foot of a good Bass and they will hit it within a second, get it near enough to the cover and they will have it big time. With Large Mouth and Small Mouth Bass, it’s all about the “odds” and the energy used: food gained ratio. If they are hungry, the odds of catching it are high and the size of it is worth it, they’ll take it every time. 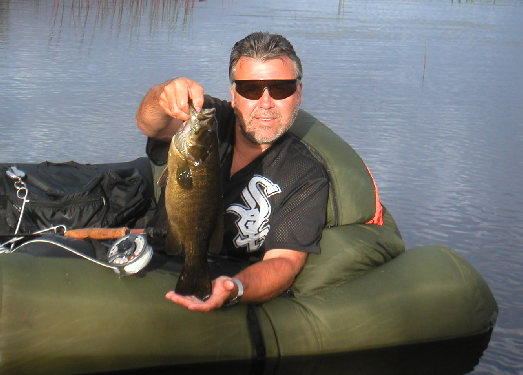 Unlike in the USA, in Canada you can not fish for Bass in spring during the Spawning season (thank goodness) so you are not relying on a “defensive” strike from a nesting Bass. It’s all about the food and how easy it looks to catch and eat. If the cover is dense or the Branches too risky, use poppers with “Snag” or “Weed” guards, they are made of 20/30lb mono and are stiff enough to cover the hook gape but supple enough to move when a Bass nails them (to allow hooking but reduce snagging). Bass will stay near cover because it shades them from the light and allows them to ambush passing food without being in the open. They will readily look up to the sky to take frogs/mice/wasps/daddies/wounded fish in lower-light conditions such as dawn or dusk. I have lost count of the times where I have started a retrieve, got a knot in the line, and while picking out the knots and having the fly sitting still for 20 seconds a big Bass has engulfed my stationary popper. Mix it up, pop 5 times then count to 10 pop twice leave for 2 seconds and so on. When you work out how hungry and how aggressive they are, you can keep going at that speed. When the sun comes up and they stop hitting on the top, it’s time for the worm/leech/frog/baitfish/crayfish patterns fished slower, the odd twitch/strip if needed. Remember to match the retrieve with the food type. Leeches (Rabbit or Mink Strips) do not move like a bait fish, they are taken on the drop or twitched very slowly. There are some great books around on Bass/Warm Water flies, one of the better US Bass-Fly creators is a guy called Dave Whitlock, a “Google” on him will turn up a whole selection of books and videos to help you learn/tie and fish your Bass flies. Some trout flies work very well, Woolly Buggers in all colours and GB Orange Fritz Lures are standard flies in my box. Big Wasps and foam Hoppers work well in summer. Rock Bass and other “Pan-Fish” just cannot leave floating wasps alone; you may even get tired of unhooking these fish which only grow to about 1lb max. I tied some onto some 15 foot whips with 10 ft of backing and 5ft of 4lb tippet for the kids, they caught hundreds. Good mixes of Poppers from troutpoppers.com or from Bass Pro Shops are fine but some Deer Hair “Messenger Frogs” will catch some bigger Bass. Don’t forget the Huge Pike and Musky Pike in the Lakes, Pike Flies and wire leaders would come in handy. To catch the biggest Bass, use bigger flies and Poppers, to catch tons of smaller fish Bass/Perch/Bluegill/Sunfish/Pumpkinseed, use smaller streamers and nymphs or rubber-legged spiders/wasps/foam flies. Remember the bigger fish have got where the are today because they are smarter, so to catch specimen Small Mouth Bass from 5lb up to 10lb (record) on a fly, you will need to be as cunning as fox, watch your shadow as the sun rises and sets, move slowly in the float tube and cast a big fly a good 15 to 20 yards. Don’t try casting a huge popper on a 3 weight rod; it will not have the power. Stay as far away from the good structures (either wading or float tube) as you can and try to cast a popper a good distance, floating lines are a must for Popper Fishing. Tippet size not critical, I tend to go no lower than 8lb to turn the Popper over, keep the leader and tippet no longer than the rod length to help with casting. Large Mouth Bass grow bigger in the Southern USA but the Small Mouth bass in Ontario are bigger than in the US. Bass have hard mouths so keep your hooks SHARP and when they take and dive down STRIKE, they will go acrobatic at least for the first few seconds before they try to head down deep. Small Mouth Bass seem to fight the hardest and have powerful runs so keep as much line as possible on the reel to avoid tangles. You WILL lose fish in the air so accept and move on, don’t beat yourself up. Keep your rod up and use the bend to play the fish, keeping the tip low will result in more dropped fish and snapped tippets. If the temperature drops (and Pressure) have a family day and save the fishing for the more stable weather days as sudden changes in weather can put the Bass in a sulky mood. There are some good “Fishing Ontario” books which list all the main lakes in various zones, it’s worth spending a few quid to find out which lakes are shallow and hold the most Bass. Deeper Lakes have Big Trout and Pickerel (wall-eye) because of the temperatures but they can be hard to catch in summer. If you’re really hoping to keep the family happy but you really want to fish every day, do it from 6am to 8am and from 7pm to 9pm to get the best results in August without spending all day on the water. Evenings and sunsets are great to fish but don’t forget the mossies at this time of the day are very active. You may see some lovely turtles in the lakes; they can grow up to the size of dustbin lids. Tell the kids to leave them alone as they have long necks and will be able to swing round and nip. Large Snapping turtles can be seen but they are quite timid and will leave you well alone. Some water snakes will be seen, 99.9% harmless, they do have some type of Rattlesnake in Ontario but not in Muskoka area. The worst wildlife encounter I have personally had was a leech on my toe. Pour salt on them and they peel off without too much bleeding. Pull them off and you’ll have a bit more of the red stuff flowing as they make a bigger hole. I have spent hours and hours in the water over the last 4 years and only ever had one leech on me. Wear Water Shoes and don’t stand motionless in weeds for hours and you will avoid them. There are many websites to visit regarding fishing in Ontario, here are a few good ones including good rental sites for Lakeside self-catering accommodation.